Imposing hills, mighty Brahmaputra River, exciting wildlife and plush flora and fauna makes Assam a heaven on the Earth. There is nothing better than the M.V. Mahabaahu Cruise to sail along the famous destinations in North Eastern India. The 8 nights and 9 days tour takes you to the famous temple, wildlife sanctuary, tea estates and much more. Marvel at the glimpses of the cultural ethos of Northeast India. After reaching the Kolkata airport, meet our tour representative, who will help you with guided transfer to the hotel. 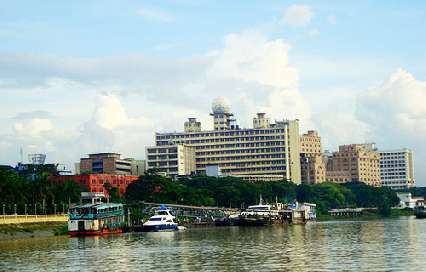 Formerly known as Calcutta, the city is nestled along the banks of river Ganga. Trams, Victorian style architecture and Howrah Bridge bring much of the fame for the town known as the ‘City of Joy’. The Sunderbans, a UNESCO World Heritage Site lures number of tourists for its immaculate beauty. Rest of the day is at your leisure, where you can enjoy various activities of your interest. Try exploring the amazing city and be a part of the vivacious nightlife. Board a flight to Guwahati in the morning. On reaching Guwahati airport, meet our tour representative who will aid you with an assisted transfer to the ship. If all goes well, you may get lucky to offer prayers at the famous Kamakhya Temple, the holy shrine is also counted amongst the 51 Shakti Pithas. Ten individual temples devoted to ten Mahavidyas are also present within the complex. Innumerable pilgrims throng the holy place during the annual Ambubachi Mela. After paying homage, continue your journey towards the ship. After reaching, board the cruise and complete the check-in formalities. You will be guided towards your room. Rest of the day is free to settle in the comforts of the cruise. The M.V. Mahabaahu Cruise will start sailing towards the Kiriakara in the evening. Enjoy an overnight stay on the cruise. Start the day with a hearty breakfast. The cruise will start sailing towards Tezpur. 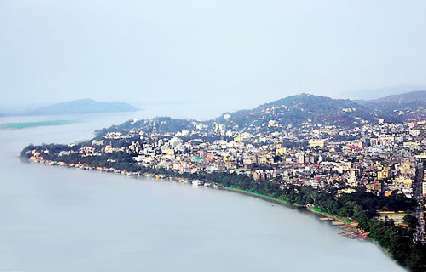 Settled along the lengths of River Brahmaputra, Tezpur is a fast growing city. Also known as the ‘Cultural Capital of Assam’, the city holds various myths associated with it. While en route, you are free to unwind yourself with a massage in the spa, enjoy Jacuzzi and swim in the pool onboard. Optionally, you can do some bird watching from the deck and enjoy the fleeting sight of the Gangetic Dolphins. Feel free to watch a DVD on the tribes of Assam and read some books in the well-stocked library. Afternoon is reserved for entertaining you with a presentation on the ‘Wildlife of Kaziranga’. This virtual tour to Kaziranga will give you insights about the national park, so that you can become aware before the actual visit. The cruise will anchor at Tezpur in the evening. Enjoy an overnight stay on the cruise. The journey resumes post a healthy breakfast. 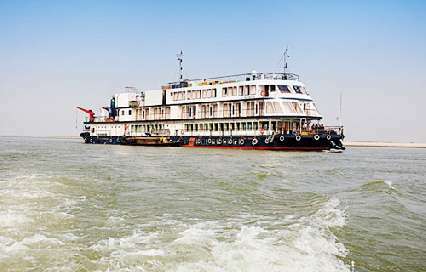 The cruise will start sailing towards Silghat, a river port along the mighty Brahmaputra River. Satiate you hunger with delicious lunch which will be served onboard. 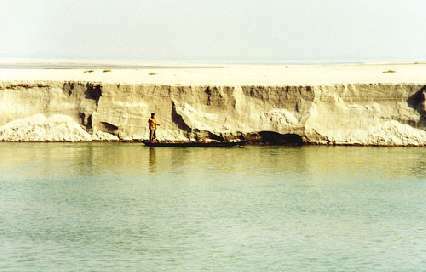 After reaching the Silghat, the cruise will drop its anchor. Deboard the cruise in the afternoon and hit the roads to a nearby tea estate. Soak-in the beauty of the place. Breathe in the fresh aroma of tea leaves and feel refreshed. Enjoying strolling through the manicured gardens and behold the sight of tea leaves pickers at work. See how carefully the tea leaves are handpicked and toppled in the basket. The experience is really amazing. Thereafter, you will be given a chance to be a part of the discussion about ‘How to make a cup of tea?’ Show your tea making skills or note down interesting points which you weren’t aware about making a perfect cup of tea. A cultural program will amuse you to the core. Once done with all these, return to the ship for dinner and a comfortable overnight stay. The day begins early in the morning by getting ready to explore the Kaziranga National Park. The National Park is a UNESCO World Heritage Site. Counted as one of the popular wildlife sanctuaries in India, the National Park is abode of two-thirds of world’s great one-horned rhinoceros. One of the most sought after wildlife holiday destinations in India is dotted with elephant-grass meadows, swampy lagoons, and dense forests. An appetizing breakfast awaits at a resort in Kaziranga. The breakfast is followed by reaching the Kohora Gate for embarking upon a Jeep Safari to traverse the length and breadth of the national park. Spot rare species of flora and fauna. Try to recognize as many birds and animals as you can. The ethereal joyride will surely prove to be a memorable one. Thereafter, you have to return to the ship for enjoying a delectable lunch. The ship resumes to sail towards the Biswanath Chariali, the city which houses first ‘Clock Tower’ of Assam followed by the clock tower of Dibrugarh. Ride in small boats to reach the amazing town. The ride will be undoubtedly the best of all. Upon reaching, you will witness how women master the art of silk and cotton weaving in their houses. Evening will be reserved for a traditional dance performance onboard. Try to practice some dance steps. This entertaining act will be followed by presentation about how to wear an Assamese Sari. An overnight stay is planned on the cruise. The cruise will start sailing towards Majuli in the morning. Watch a DVD on ‘Tribes of the North East’ onboard. Savor a mouth-watering lunch. This will be followed by a boat safari to Majuli Island. Marvel at the natural treasures of the Island. Counted as the world’s biggest Island in the world, Majuli is a pristine and pollution-free water Island. The place is so dreamlike that it may soon become a UNESCO World Heritage Site. Subsequently, you will return to the vessel to continue sailing towards Majuli. In the evening, enjoy a cooking demonstration which will be followed by a bonfire session at the remote island. Moments spend will be unforgettable. Thereafter, return to the ship for dinner and overnight stay. The journey towards Majuli begins in the morning. However, a halt is planned en route at the Mishing village. Visiting the Mishing village is an exceptional experience. Witness how Kamlabaru Satra priests perform a powerful melody and chant called as Gayan Bayan. Post the short trip to the village, start cruising towards the Majuli. Make your travel comfortable by availing various services onboard. Enjoying swimming in the pool or take a Jacuzzi bath. Upon reaching Majuli, partake in healthy discussion about the ‘Presence of Vaishnavism in Assam’. The discussion is flowed by delectable dinner and a comfortable overnight stay onboard. Start the day in a healthy way by attending a Yoga Session onboard. After breakfast, disembark the cruise for visiting the Satras in Majuli. Satras are basically Vaishnavite monasteries. These are an integral part of the Assamese culture. Majuli is bountiful of ancient monasteries and Assamese culture. The monasteries were built around 15th century. Explore the Samaguri Satra in Majuli. The satra is famous for traditional masks that are made here. The place is also counted as important pilgrimage center. If you haven’t seen the mask dance here, you haven’t seen anything. Don’t forget to praise the craftsmanship of the artisans who show their excellent skills while preparing the masks. From there, you will be taken to the Kamalabari Satra. Bodula Ata established the original Kamalabari Satra. With the passage of time, the Satra was divided into two Natun Kamalabari and Uttar Kamalabari, famous for Saali Nitya (a dance form) and Ankia Naat. Don’t forget to witness young monks performing Matia Khora. Thereafter, return to the cruise for having lunch. The ship will start sailing towards Nimati. The cruise will halt for the day and you can taste delicious dinner flowed by overnight stay onboard. Enjoy a hearty breakfast in the morning. Disembark the ship and start traveling towards Sivasagar meaning the ‘Ocean of Siva Singha’. The place is famed for its Ahom monuments and palaces. The night view of the Sivasagar tank looks immensely beautiful. From innumerable temples to majestic forts with underground architecture, the cultural town has it all. From here, you will be travelling towards airport by road. You will be provided with packed lunch. Upon reaching the airport, board the flight to Kolkata. After arriving on the Kolkata airport, board the flight for your onward journey.